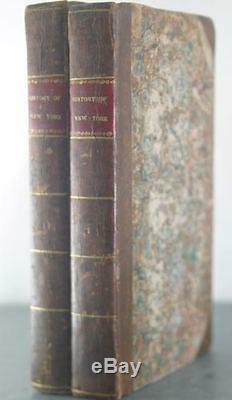 A History of New York, from the Beginning of the World to the End of the Dutch Dynasty [Two Volumes]. Author/Artists: Knickerbocker, Diedrich [Irving, Washington]. 8vo, half polished calf over marbled paper, 296 + 265 pp. A well preserved early edition, in very good plus condition with light wear to boards and excellent contents. A monument of mock-erudition, it is perhaps his greatest book. As history, it is mostly exaggeration and invention, spurious by design. As humorous fiction, it is an odd coupling of sense and nonsense held together by the inspired contrivance of Knickerbocker, the rattlebrained scholar whose "history, " left behind in a New York rooming house, is the text with which the reader must contend. The item "A History of New York, from the Beginning of the World to the End of the Dutch D" is in sale since Tuesday, January 24, 2017. This item is in the category "Books\Antiquarian & Collectible". The seller is "northwoodsfinebooks" and is located in Brattleboro, VT. This item can be shipped worldwide.